The Toyota Venza is a new Camry based 5-passenger crossover. Although it is arguably a Camry station wagon, the Venza offers optional AWD and a five-inch taller profile to appeal to the SUV crowd. The inside features front bucket seats, a pronounced center console and a 60/40 split rear seat to expand the cargo area. Toyota offers the Venza with a choice of four-cylinder and six-cylinder engines each mated to a standard six-speed automatic. A number of new features appear like the panoramic sunroof and automatic high beams on the headlamps. 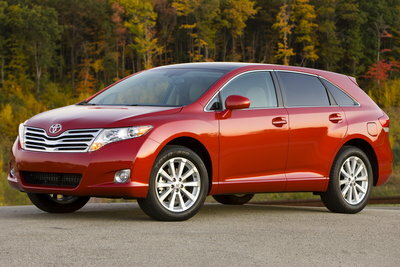 The Venza will be produced in KY and will go on-sale in late 2008. The Toyota Venza is a new Camry-based 5-passenger wagon with a 5-inch taller profile. The inside features front bucket seats, a pronounced center console and a 60/40 split rear seat to expand the cargo area. Toyota offers the Venza with a choice of four-cylinder and six-cylinder engines each mated to a standard six-speed automatic. All-wheel drive is optional.